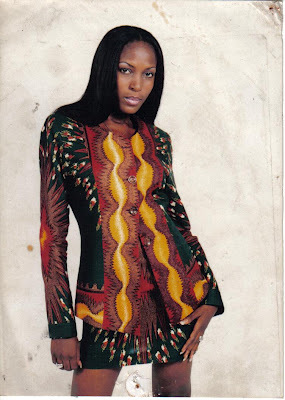 Yimiton's Blog: What makes Linda Ikeji a failed Model? I stumbled across lindaikeji's post of May 4th 2007 titiled:" 'Got Ya! + Linda Ikeji Pictures " and this made me think of Tonto Dike's comment on Twitter refereing to Linda as a failed model. Was Linda actually a failed model? From what I saw on Linda's post, she had worked with all the major designers in Nigeria at the time and appeared on all major fashion shows. She posted over 30 pictures to show for it . This made me wonder, what precisely the description of a failed model in Nigeria is. Is it the fact that she retired when she deemed it fit to or was it because she didn't proceed to Milan, Paris and New York? Some of the designers she worked with: Jimi Delaja, Regalia, Tiffany Amber, Labanella, Rose of Sharon, Mon ami, Bijoux Boutique, Mudi, Dakova and so many others. She even modeled for MTN! Abeg you people should tell me, what more could she have done to have earned her a name "Successful Nigerian model"? Seriously, I think Linda did a great job as a model and just like Tyra Banks decided to follow another passion when it was time to move on. who even cares about her modelling anymore. what we know is that she is the Queen of Naija blogging and we are fine with that. Nice One. some haters really wanna rubbish her. @Kanyinulia, thankfully, Linda lives her life like an open book. Plp can actually try but it will be hard to succeed being that there's nothing they can say that we don't already know. Lol. Linda is successful, as a model she succeeded and as a blogger, there's no amount of bile/venom that can change that. We just need to learn to celebrate ourselves because the affairs of life are "turn by turn". Kudos, nice blog you have there. Linda is doing great. Leave beefers wey don miss their calling for nollywood.